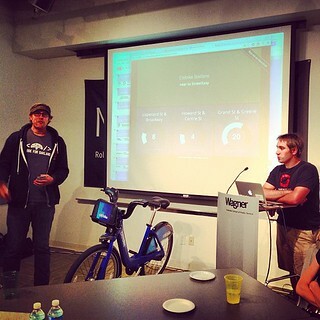 OpenShift meets #BetaNYC, a #CfABrigade for NYC. Tonight, #BetaNYC was honored to have OpenShift as a sponsor and have two of their best evangelists show us how to make better civic apps. Now, we are ready to build scalable apps and hand them off to others. Thank you Red Hat’s Fotios Lindiakos and Ryan Jarvinen! PS – It was great to have Ryan, an OpenOakland member, share his experiences with west coast #CivicHackNights.